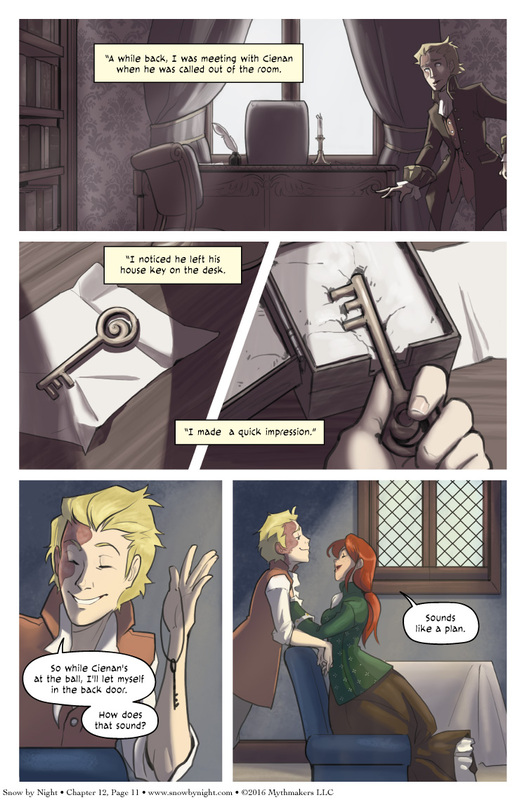 Vivienne and Jassart brew up a plan to retrieve the mask on Chapter 12, Page 11. Vivienne does like her scoundrels. To see the plan in action, please vote for Snow by Night on Top Web Comics. Cienan: “Oh Jassart, always so predictable. Well, I shall go. This will prove amusing, at least”. In fact, it’s pretty darn cool. Cienan ‘just happened’ to leave the room and ‘just happened’ to leave his key in plain sight? I smell a set-up. Jassert is missing Blaise’s paranoia. Indeed. I’m actually kind of surprised Viv didn’t pick up on this. Yeah, Cienan doesn’t strike me as the sort to do *anything* by accident, let alone leave his key out. They’re made for each other. I liked her till she started hooking up with Jassart. Now I want everything to blow up in their face. Everything. Kinda makes you wish you still had Blaise around to pick locks, eh?